The period from 1960 to 1982 saw the greatest technological changes in the history of Formula 1 racing: the transition from front engines to rear engines, narrow-threaded tires, massive racing slicks, zero downforce, and neck-shredding ground effects-and, of course, a staggering increase in performance and reduction in lap times. In short, the period saw the creation of the modern Formula 1 car. This is also the time when legendary names who defined F1 were out in full force: Jim Clark, Jack Brabham, Dan Gurney, Sir Jackie Stewart, Graham Hill, Niki Lauda, James Hunt, Bruce McLaren, Jody Scheckter. We'll see and meet all of them. But F1 Mavericks also focuses on the designers and engineers behind the cars-men like Colin Chapman, Sir Patrick Head, Maurice Philippe, Franco Rochhi, Gordon Murray, and many others. We'll hear directly from many of them, including a foreword from 1978 F1 World Champion, Mario Andretti. Every chapter is a photographic account of key races throughout the period, supplemented with sidebars featuring key designers and technologies, like wings, ground effects, slick tires, turbochargers, and the Brabham "fan" suction car. 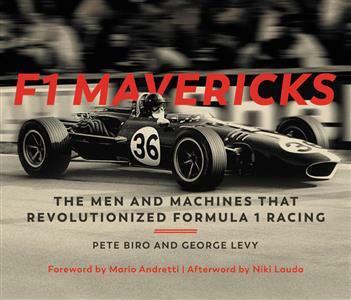 F1 Mavericks is an international story, and includes loads of information on designs from Japan (Honda), Britain (McLaren, Tyrrell, Cooper, BRM) Italy (Ferrari, Maserati, Alfa Romeo), France (Matra, Ligier, Renault), Germany (Porsche, BMW) and the United States (Eagle, Shadow, Penske, Parnelli). Strap yourself in for the story of the greatest era in Formula 1 racing-it's all here in F1 Mavericks.